Above mentioned, the people of the Yayoi had carious lesions that were most frequently located on the root surfaces of their teeth. Root surface exposure is a prerequisite for this type of decay, and alveolar bone loss is the main cause of such exposure. Therefore, we identify the factors associated with root caries, and examine the relationship between root caries and alveolar bone loss in the people of the Yayoi period. As shown in Table 2, the prevalence of root caries was significantly higher (78.7%) among those with a mean CEJ-AC distance >3.4 mm than among those with a distance <3.3 mm (54.1%). In addition, significant differences in the mean number of teeth with root caries were observed according to age, presence of coronal caries, and the mean CEJ-AC distanceper person. The prevalence of root caries and the mean number of teeth with root caries per person were significantly associated with the mean CEJ-AC distance per person. Table 2. Root caries prevalence and mean number of teeth with root caries per person by CEJ-AC distance per person. Figure 6 shows the percentage of root caries surfaces per tooth surface according to the mean CEJ-AC distance per tooth surface. We calculated the percentage of each root surface (distal, buccal, mesial, and lingual/palatal) affected by caries. 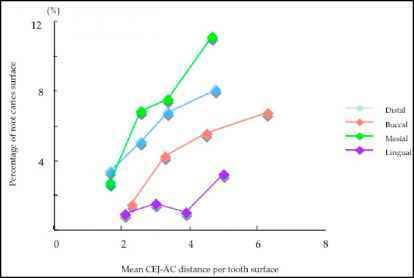 Those subjects with a greater mean CEJ-AC distance per tooth surface had a significantly higher percentage of surface root caries for all surfaces compared to those with shorter mean distances. For the upper and lower molars, the mean CEJ-AC distance per tooth surface was based on the presence of root caries (Table 3). In the upper jaw, root caries on the distal surface of the premolars or on the distal, mesial, and palatal surfaces of the molars, were significantly associated with a greater mean CEJ-AC distance value per tooth surface. In the lower jaw, significantly greater distance values were associated with root caries on the distal, buccal, and mesial surfaces of the molars or on the distal and buccal surfaces of the premolars. Our results confirm the relationship between root caries and the CEJ-AC distance, which is used as an index of alveolar bone loss, in the bones of the Yayoi people. In ancient agrarian populations, the amount of starchy mass on the tooth surface was probably a key factor in the development of root caries. In addition, alveolar bone loss, which is a major cause of root exposure, tends to precede the development of root caries. Several reports have suggested an association between the occurrence of caries and periodontal disease in ancient populations, although no previous studies have examined this correlation. Thus, the findings of the present study are valuable because they clarify for the first time the relationship between root caries and alveolar bone loss in an ancient population (the Yayoi people). To our knowledge, this is the first study to evaluate the relationship between root caries and CEJ-AC distance using skeletal remains. Previous reports regarding caries (Haraga, 2006) and alveolar bone loss (Uekubo T, 2006,) among the Yayoi people indicated that carious lesions on the approximal surface were common. The present study, which reveals a CEJ-AC distance-dependent increase in the percentage of surface root caries, confirms these findings (Figure 7). We believe that the close relationship between root caries and alveolar bone loss on the approximal surface is suggestive of the involvement of this bone loss in the manifestation of root caries. Although the mechanism of alveolar bone loss in the Yayoi people has not been elucidated, root caries may be a consequence of alveolar bone loss. Fig. 7. Relation with percentage of root caries surfaces per tooth surface and mean CEJ-AC distance per tooth surface. Table 3. Mean CEJ-AC distance per tooth surface by the presence of root caries.